Dealing with paint problems is never fun! Davis is here to help you figure it all out with our online Paint Problem Solver. We cover everything from blistering to wrinkling, and everything else in between! Davis will show you all possible paint problems along with pictures and the best ways to fix and avoid these problems in the future! 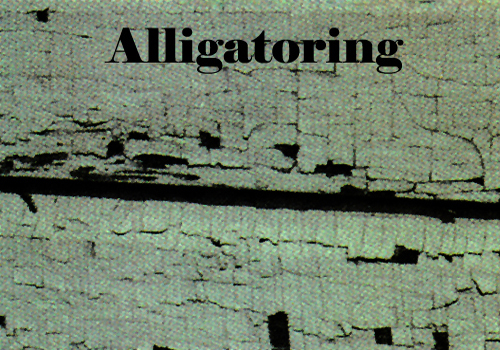 Alligatoring is when the paint begins to form wide cracks that resemble alligator scales. Cause: Generally this happens when you are applying a topcoat to a glossy surface and it cannot bond properly. Insufficient dry time can cause this as well. The main cause of alligatoring is when there a multiple coats of an oil based paint that have aged and become brittle over time. Solution: Remove all loose paint. Sand the surface smooth. Powerwash and repaint according to instuctions. 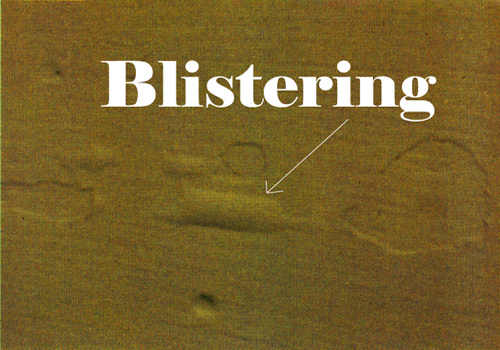 Blistering is when paint has the appearance of air pockets, or bubbles, lodged underneath the surface. They may be in groups or even a single air pocket. Cause: This usually occurs when there is moisture trying to escape from the wood through the paint. This normally happens when the temperatures are above 90°F. This can also happen when using oil based paints on damp surfaces. High humidity prior to painting is also a cause. Solution: Make sure you find and remove the source of the moisture and make sure for future reference to control moisture with proper venting, stopping of leaks and using a good sound caulk. Make sure you remove all blisters and other loose paint. Sand and remove any debris with powerwashing. Then prime and paint according to directions. 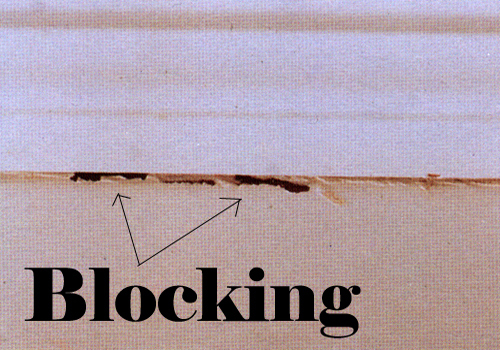 Blocking is primarily an interior paint problem. Blocking occurs when two painted surfaces, such as a door and window, are pressed together, causing them to stick, thus damaging the paint. Cause: Blocking usually occurs when there is insufficient drying time before pressing the newly painted surfaces together. Solution: Make sure you allow proper drying time as stated on the paint can label instructions. Make sure all doors and windows are moving freely before any painting is done. Sometimes talcum powder can help if the blocking is persistent. Burnishing is an interior paint problem. Burnishing is when spots of increased sheen on the surface of the paint when it is rubbed. 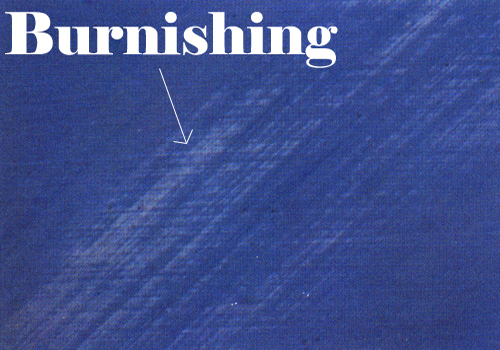 Cause: Burnishing occurs with flat paint in high traffic areas or where there is a constant touch of an object against a wall, such as a couch or chair. Solution: Use a high quality paint in these areas. A good scrubbable and washable paint works best. Try to avoid flat paints if possible as well. When cleaning, use non-abrasive detergents with a soft sponge and clean water. Remember, the glossier the surface, the easier it is to clean! 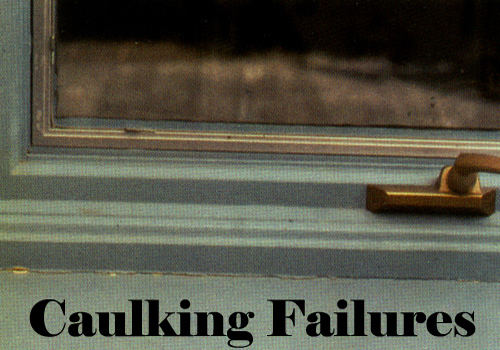 A Caulking Failure means there has been a loss of the protective moisture seal around doors or windows, due to the loss of the initial adhesion and flexibility. Cause: In this situation the cause can be anything from filling too large a space or opening, using the wrong type of caulk, movement around the area meant to be sealed or the age of the caulk in general. Solution: Make sure you take the time to select a caulk that best suits your situation and apply according to the directions on the package. For most interior painting, an acrylic caulk will work fine. If you choose to use a silicone caulk, DO NOT PAINT OVER IT! 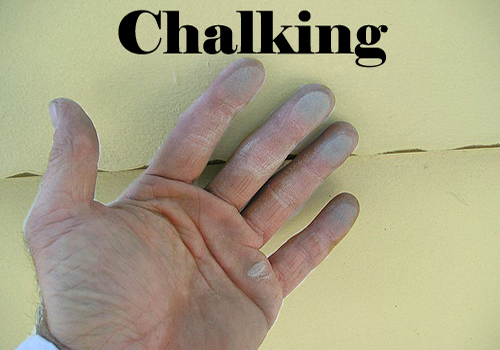 Chalking is when an excessive or heavy powdering coats a painted surface. Cause: Chalking is natural overtime due to weathering, especially with oil based paints. Paints using clay instead of Titanium Dioxide will also chalk quicker and easier. Using an interior paint outside or over thinning your paint can cause chalking as well. Solution: Remove all chalk dust from the surface. This usually requires a stiff bristle brush for most serfaces, however, a wire brush may be required for masonry surfaces. Washer thoroughly to remove any remaining dust. A pressure washer may be required. 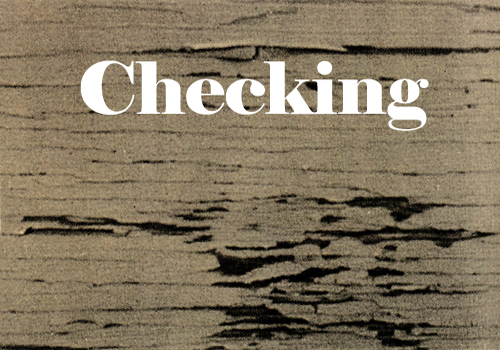 Checking & Flaking is paint that is loaded with hairline cracks. It will eventually flake off as the cracks become more evident and begin spreading. Cause: Most of the time this is due to poor surface preperation or applying a paint that is too thin. Because of this, the paint does not have its elasticity and therefore does not expand and contract properly with the changes in humidity and temperature as the wood swells. This can also occur in paint that has aged and dried out. Solution: Remove all loose paint and powerwash. Sand edges and rinse again removing any debris and dust. Prime and repaint the surface following the directions closely. 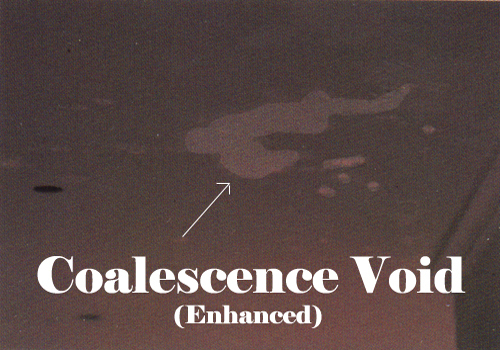 A Coalescence Void means the paint is not forming a continuous film as it dries. Cause: This occurs because the surface temperature of which you are applying the paint to, is too cold, usually below 50°F. Solution: Avoid painting any interior or exterior surface when the temperatures are too cold. If its warm in the afternoon but expected to cool down in the evening, you need to make sure you have enough time to allow for drying before the temperature drops. There are some places that manufacture a cold temperature paint as well. 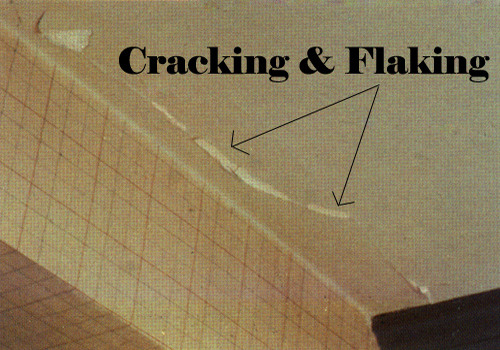 Cracking & Flaking is when paint begins to split and flake apart with age. Cause: This usually occurs with oil based paints which is old and has lost its adhesion as well as flexibility thus making it very hard and brittle at the same time. Poor or improper surface preperation can also be a factor causing cracking and flaking. Solution: Before painting make sure you have removed all loose paint, sand the surface and feather the edges. Spackle any deep holes or scars which may have been caused by the initial cracking and flaking. Make sure you prime all bare spots. 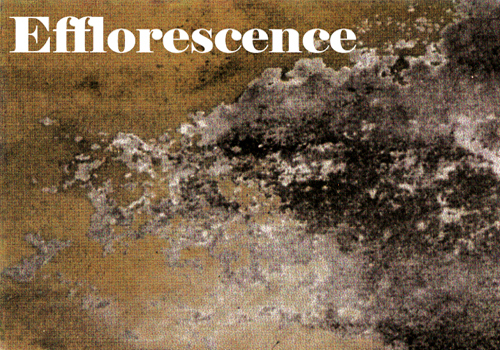 Efflorescence is a salty deposit from moisture that has leached from masonry or mortar as the moisture passes through. Cause: The cause of efflorescence is excessive moisture, inadequate venting or moisture laden areas and a lack of curing time. Excessive lime in concrete will cause this to occur. There are soluable salts in masonry and when dissolved by water it will appear on the surface as crystallized salts. Solution: This requires the removal of the moisture source. Once that is complete, prep surface, prime and paint according to directions. If this is a masonry surface, a masonry primer/sealer is the highly recommended. Make sure it is completely dry before applying any topcoat system. 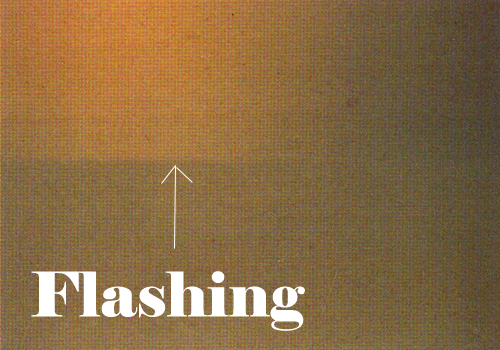 Flashing is simply an uneven sheen. If you have a glossy surface, you will see spots of dullness. On a flat surface there will be glossy spots. Causes: This mainly happens when priming. Either the surface was not primed or it was improperly primed. Sometimes painting over a primer before it is completely dry will cause this problem as well. Solution: Always prime the surface properly and allow to dry before applying any topcoat. A fresh coat of paint will make the sheen uniform in appearance. 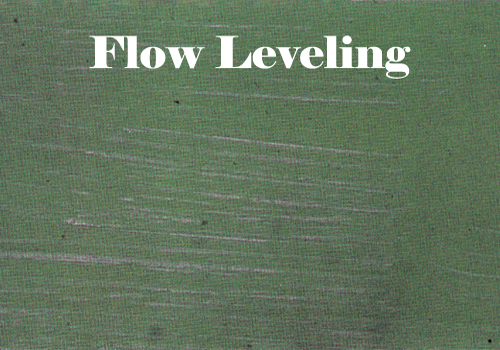 Flow & Leveling Failure occurs when excessive brush or roller marks leave a non-uniform film. Cause: This is usually due to using the wrong type of brush or roller; or even ones of poor quality. It can also be caused by simple not taking time when painting to make sure the work is done corrently. Solution: Proper surface preparation is very important as well as using the quality of brush or roller recommended in the directions. 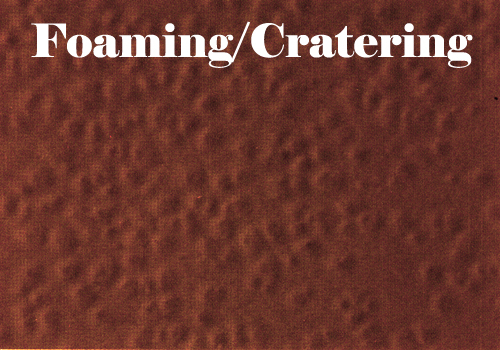 Foaming & Cratering is when excessive bubbles appear in the paint film and do not flow out while the paint is being applied. This dries to form a bumpy/bubbly surface. Cause: Using the wrong size nap for the paint; painting too soon after having the can shook or rolling the paint on the wall too quickly. Using old paint can also cause this effect. Solution: Make sure you are using the correct nap roller length for the paint. Have all of your prep work properly done and follow all directions on the product label. 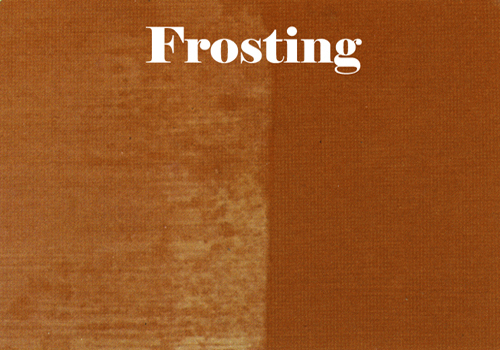 Frosting is a discoloration, mainly on dark colors, which appears to be a salty residue. This is sometimes mistaken for Efforescence. Cause: This forms in nicely protected areas which generally do not receive cleaning rains. Solution: Powerwash the area and remove all frosting with a wire brush if on masonry. If on wood, sand out. If you paint over it, there is a good chance it will bleed through the new paint. 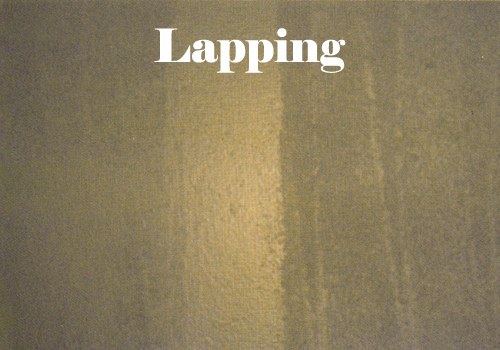 Lapping is when wet and dry layers of paint overlap. Cause: Failure to maintain a wet edge or painting too large of an area at one time. Solution: Adding another topcoat will usually hide lap marks. Always paint from wet to dry and in very small sections to always keep a wet edge. 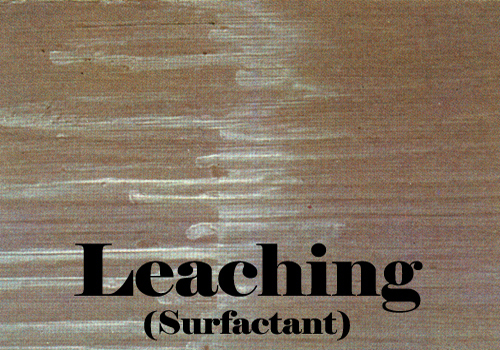 Leaching is indicated by blotchy, tan colored, glossy spots on latex paint. Causes: This usually occurs when you paint in humid cool conditions or right before those conditions occur. An example would be a late afternoon rain. Moisture collects on the surface of the drying paint and leaching may appear. Solution: Do not paint if the temperature will be below 50°F or in the late evening when its cooler. Remember, coolness extends the drying time. The surfactants that usually evaporate will rise to the surface. The residue they leave behind will disappear from weathering so letting nature take its course is the best action here. You can also rinse it away as well. 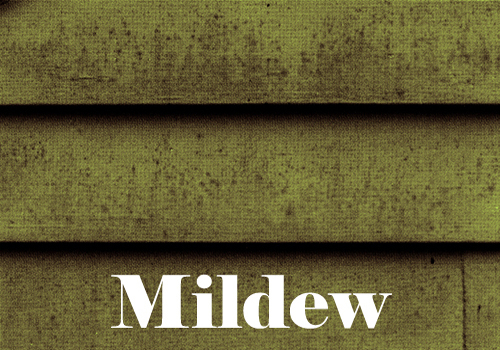 Mildew are areas of black, brown or gray spots that form on paint and other surfaces. Cause: Warm humid conditions with poor or no air circulation and very little or no direct sunlight and form mildew. Examples would be bushes that are planted to close to a home. Solution: Mildew must be removed from the surface before painting or else it will bleed through. Use a solution mix of 1 part bleach and 3 parts water to remove. Rinse well. Powerwashing is highly suggested. 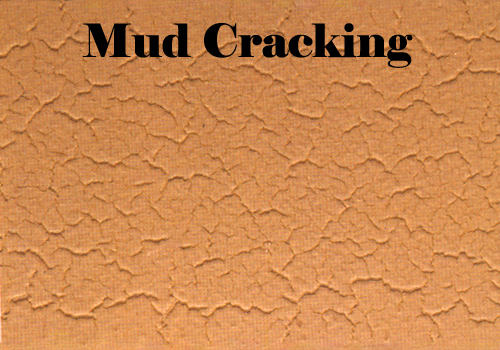 Mud Cracking is when the paint dries to look like dried mud with deep and irregular cracks in the paint film. Cause: This occurs when the paint is applied to thick making the film unable to dry properly. Solution: Remove the excessive paint in the affected areas by scraping and sanding. Clean away any debris and repaint according to the directions. Make sure you apply a uniform film thickness to avoid Mud Cracking again. 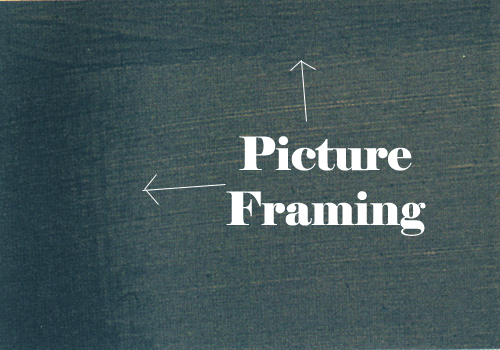 Picture Framing is the darker color that appears around ceilings, windows, doors and corner areas. Cause: Improper cutting in with a brush with too much paint will cause this to occur along with not doing a "feather-edge" brushing. Also not maintaining a wet edge will cause this as well. Solution: Keep a wet edge when cutting in and use a feather brush cutting-in technique. Roll into cut-in areas before they dry. Make sure you stir the paint periodically to avoid settling and it become thick. 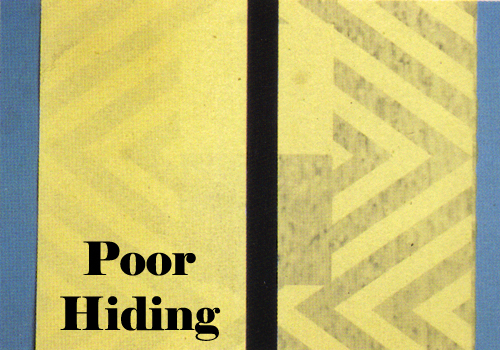 Poor Hiding is a failure on the part of the topcoat in covering the previous color or a new substrate. Cause: Usually this is due to not using enough paint or making a drastic color change. A failure to prime will also cause poor hiding paint conditions. Over thinning your paint can cause this as well. Solution: Usually another topcoat will do the job in covering the previous color or substrate completely. Make sure you prime, especially with darker colors. 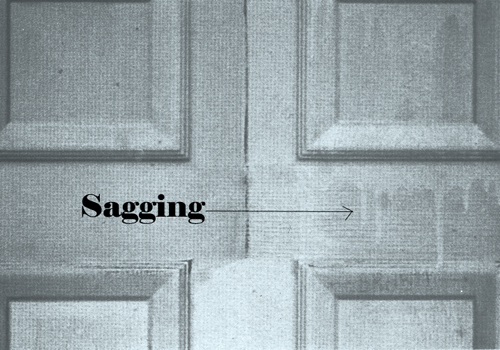 Sagging gives the appearance of paint running and leaves and uneven surface. Cause: Almost always this is due to application techinque or overly thinned paint. Solution: Before the paint dries on the surface, roll or brush out any running paint evenly. Make sure you are using even amounts of pressure when you are applying your coating and do not thin the paint. Remember, two coats are always better than one thick coat! 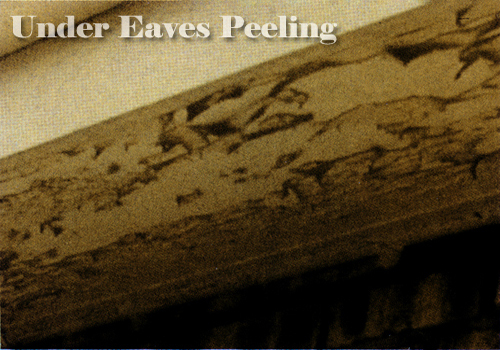 Under Eaves Peeling happens in protected or very shady areas where condensation is collects sulphur dioxide from the air leaving behind salt like crystals. These crystals will cause the paint to peel as it pulls moisture from the paint. Cause: This happens with improper surface preparation to the painted surfaces in the protected areas. This will cause a lack of adhesion of the topcoat and cause the paint to fail. Solution: Remove all loose and peeling paint. Wash and rinse and prep thoroughly. Sand any glossy areas and remove any mildew if it is present. Prime and paint according to directions. 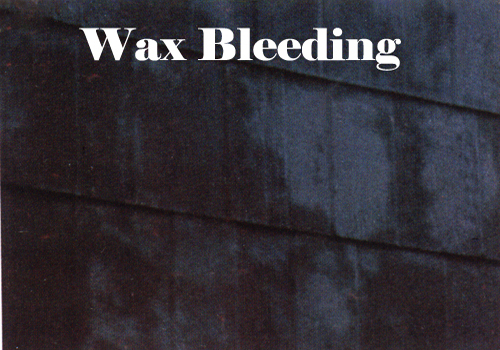 Wax Bleeding is the migration of waxy additives in reconstituted wood products to the surface causing a discoloration and a wet appearance. Cause: This can happen if the hardboard is exposed to any weather before being painted. This can also occur when the wood has not been primed or has been improperly primed. It is a fact that darker colors are more prone to wax bleeding because of the amount of heat they absorb. Flat paints are more likely to bleed over satin, semi-gloss or glossy paints. Solution: Make sure all new hardboard is painted within 30 days. Any longer will make it more suseptable to bleeding. All hardboard needs at least 1 primer coat and 2 topcoats to hold up. 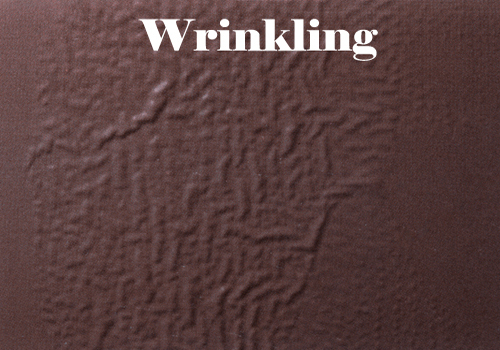 Wrinkling is due to improper painting technique that causes the paint to dry to have a crinkled surface. Cause: This usually occurs when applying too much paint or applying a second coat before the first coat is dry. Moist conditions can also lead to wrinkling or painting when the temperature is too hot or cold. Painting of a glossy surface will sometimes cause this occurance. Solution: Removed wrinkled areas and any loose paint then prep according to the directions on the can. Make sure to use a good quality primer and topcoat system.